I knew I was gay when I was 14. During a game of 'truth or dare' one of my school friends just and asked me. I could feel myself going bright red and then said, "no". I knew I was lying and I think they did too. But I figured it was a phase and that I would grow out of it. I didn't. A few years later, I watched 'the puppy episode, the coming out episode of Ellen. That was it; I was done pretending, so I Came Out. Everyone surprised me. My parents took time to adjust. I had a real issue with that. I wanted them to be ok with it as soon as I told them. I later realised that it had taken me years to deal with myself. They needed time too. I've had comments and I've had negativity, but not from anyone who matters. 99% of people don't care! I remember telling someone at work and expecting it to spread around like wildfire. Three weeks later I mentioned my girlfriend and people said, "Oh, are you gay?" I told my colleague that I had expected everyone to know by now. Her reply of, "Well, it's not really gossip, is it? It's pretty boring", put me right back in my place! My parents said when I came out, that they just wanted me to be happy and have a 'normal' life. 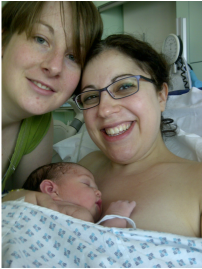 Well, I'm now married (sorry, in a civil partnership) and my lovely wife and I now have our first baby! We both have run of the mill jobs, Sunday roasts, and days out, nights in. And my parents love their new granddaughter!